Located near Lake Almanor in historic lumber town of Westwood, California - home of Babe and his Blue OX. and the beginning of the Bizz Johnson trail. 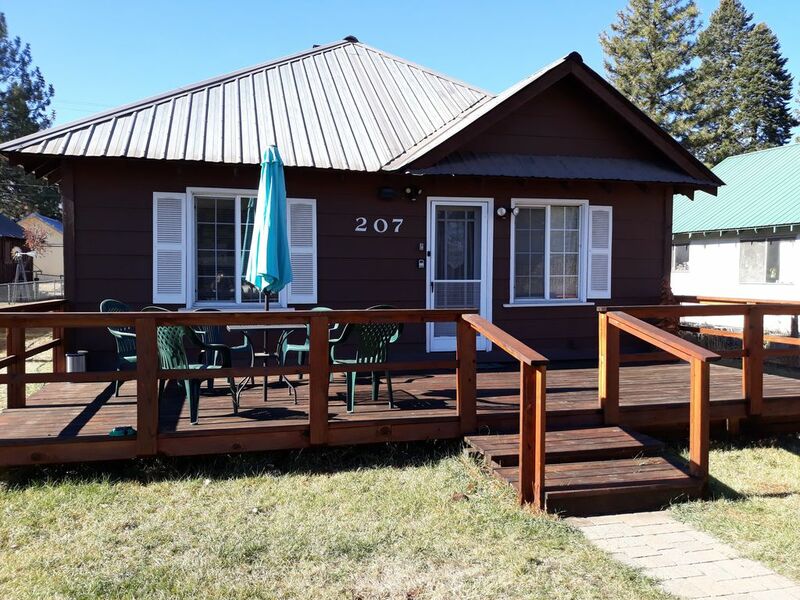 The Country Cottage has been a favorite famiy vacation destination for many years and we are now able to share it with others who love the great Northern California landscape. The home is in town on a large level fully fenced yard. Nearby is Mountain Meadows Reservior, Lake Almanor, Feather River, and Lassen Volcanic National Park. Lakes, streams, creeks, and rivers abound here . 'We enjoyed ourselves house to stay in, Westwood and surrounding area has been inspiring and restful for me and my family.' Kristina M.
'We had a great vacation here. The surroundings were spectacular. We enjoyed the Country Cottage - very comfortable accommodations for our family. We hope to come again.' Robert G.
'Thank you for giving us such a wonderful experience of staying in your Westwood house. We could enjoy a lot in Lassen Park and the beautiful surrounding places.' Jayanta D.
This was our family vacation home and when my parents passed away we were already in the vacation rental business and wanted to share this special place with family friends and guests. I have always thought of Westwood as a fishing dream destination as I have spent so many hours chasing the trout here. The Country Cottage is a very comfortable home that welcomes you to really relax, explore our town and the surrounding areas I have placed a booklet in the home letting you in on some of our in town events, places to eat, and little known areas like the Subway Lave Caves to have to see to believe. Everything is provided here. Just bring your toothbrush and clothes and food you want to eat unless you want to eat at our local restaurants. ( The Old Mill ( breakfast and lunch) Buffalo Chips ( PIzza +++) The Moonlight Cafe ( new dinner house) snack shacks and taco stands too. We also have Youngs Super Market that has been here since the early 50's and is a fixture in our town. Located in Westwood , near Lake Almanor, Lassen volcanic Park, abundant rivers , streams and lakes for fishing and outdoor recreation. Westwood is surrounded by lofty mountains and notably Dyer Mountain overlooking Mountain Meadow Reservoir. Located between Chester and Susanville this historic old lumber town has numerous places to explore both in town and surrounding area. The local museum, the loacl honey mead operation, the Bizz Johnson trail head, the layout of the streets each named after a tree type. fishing areas are all around you. HIking, and exploring the beautiful lakes, streams etc. Other Activities: A day trip to Lassen Volcanic National Park is definitely reccommended. There are some volcanic lava caves on the back side of the park. A very interesting experience to walk through in total darkness.